The global status report, produced by the Renewable Energy Policy Network for the 21st Century (REN21), said green power had reached a "clear tipping point" during 2010. "Renewables comprised fully one-quarter of global power capacity and delivered 18% of global electricity supply in 2009," it stated in its review of the preceding 12 months. The authors said the year was "unprecedented in the history of renewable energy, despite the headwinds posed by the global financial crisis, lower oil prices and slow progress with climate policy". One of the forces propelling the sector's strong showing, they added, was the "potential to create new industries and millions of new jobs". The findings also showed that emerging economies were also embracing the new technologies, especially China, which added 37 gigawatts (GW) of renewable power capacity last year - more than any other nation in the world. China was also capitalising on the global market for green energy products, manufacturing about 40% of the worlds photovoltaic panels and 30% of the globe's wind turbines (up from 10% in 2007). The report said that more than 100 countries had established a renewable energy policy, up from 55 nations in 2005. 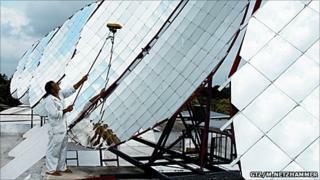 It also estimated that about 70 million households around the globe had installed solar hot water heating systems. "Favourable policies in more than 100 countries have played a critical role," said REN21 chairman Mohamed El-Ashry. "For the upward trend of renewable energy growth to continue, policy efforts now need to be taken to the next level and encourage a massive scale-up of technologies," he added. Another report, released to accompany the REN21 findings, said 2009 saw the second highest annual investment in renewables. The assessment of global investment for the UN Environment Programme, produced by Bloomberg New Energy Finance, said $162bn was invested during 2009, down 7% from the record high of $173bn in 2008. The reduced investment was a result of the global economic downturn, but the authors said 2009 was "one of resilience for sustainable energy" that saw a record level of investment in wind power, particularly as a result of projects in China and the North Sea. However, they warned that the austerity measures being introduced by a growing number of governments during 2010 could present fresh challenges over the coming months. Responding to the report, Unep executive director Achim Steiner described the past year as one of "resilience, frustration and determination". He said: "Resilience to the financial downturn that was hitting all sectors of the global economy and frustration that, while the UN climate convention meeting in Copenhagen was not the big breakdown that might have occurred, neither was it the big breakthrough so many hoped for." Yet there was a determination, he added, especially among developing nations, to transform the current economic uncertainty into an "opportunity for greener growth". Michael Liebreich, chief executive of Bloomberg New Energy Finance, said the relative stability of the sector showed that "clear energy was not a bubble created by the late stages of the credit boom, but was instead an investment theme that would remain important for the years ahead". But Mr Steiner warned: "There still remains, however, a serious gap between the ambition and the science in terms of where the world needs to be in 2020 to avoid dangerous climate change." Who pays for UK coalition's 'green economy'?